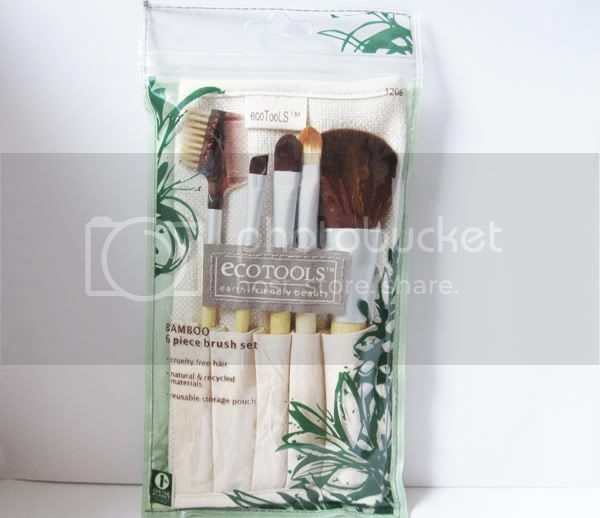 One of my favourite beauty gifts that I got for Christmas, has to be this Bamboo 6 Piece Brush Set from Ecotools. I have wanted to try out this brand for ages so I was over the moon when I unwrapped this! 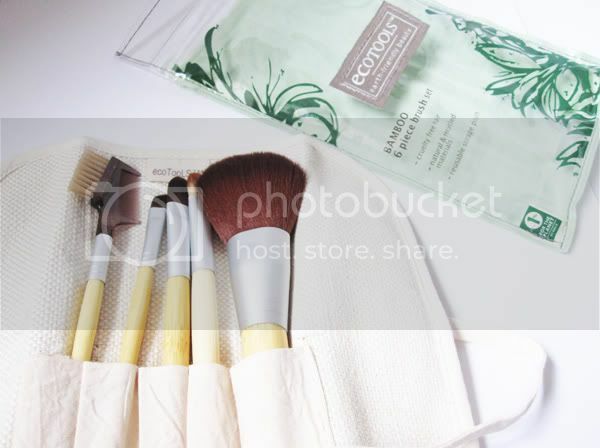 For those unaware of Ecotools, they are a fantastic 'earth-friendly' company who make a whole range of make-up brushes & beauty related accessories from natural, sustainable and recycled materials. For example, all of the brushes in the above set have a handle made from bamboo (a highly sustainable plant), a ferrule made of recycled aluminum and the bristles are synthetic Taklon which is 100% cruelty free. Pretty neat! The above set comprises of six brushes all wrapped up in a cosmetic pouch roll made from natural cotton and hemp. 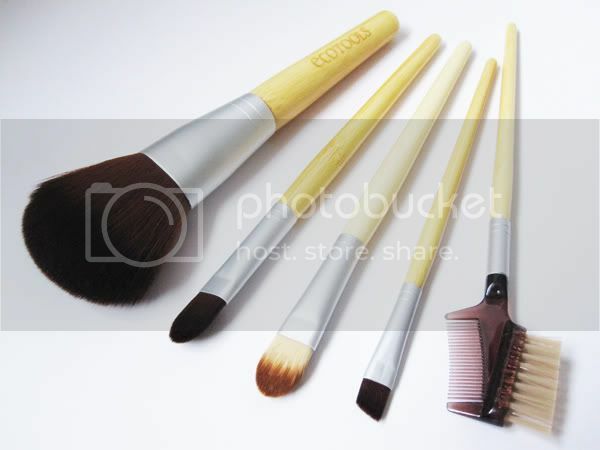 So you have the following:- (1) Blush brush, which is similar in size and shape to ELF's Complexion Brush. This is lovely and soft, as well as being the perfect size for all manner of powder applications. I've used it with blush, bronzer and translucent powder so far and it's worked really well. (2) Eye Shading Brush, this is good for applying base colours over the lid. (3) Eyeliner Brush, perfect for using with gel/cream eyeliners, as well as being the right shape for filling in your brows. (4) Lash and Brow Groomer, pretty simple and does the job. (5) Concealer brush, nice and flat for blending with, but soft enough to use under the eyes too. Summary: these are all excellent quality brushes and the set is ideal for taking with you travelling thanks to the handy pouch roll. It's great to find a set of make-up brushes that are really good AND are kind to planet. Doesn't get much better than that if you ask me :) I REALLY want to try out more of these! P.S I also randomly picked up one of their packs of Sustainable Facial Buffs after my Konjac sponge finally fell apart after three months of use and began to biodegrade itself. In this pack you get two buffs and they're double-sided. The front side is made from natural loofah and the reverse side is made with viscose from bamboo. To use it, you just pick which side you want, wet it and apply your cleanser/face wash. I find that the front side exfoliates really well, whereas the smoother reverse side feels like an ordinary flannel/face towel so would be better for those with sensitive skin. I do like this, especially the exfoliating side, but it does soak up a lot of water and requires slightly more than 24 hours drying time between uses. However, the pack cost just under £3 and I'll more than get my money's worth out of it by using the exfoliating side. 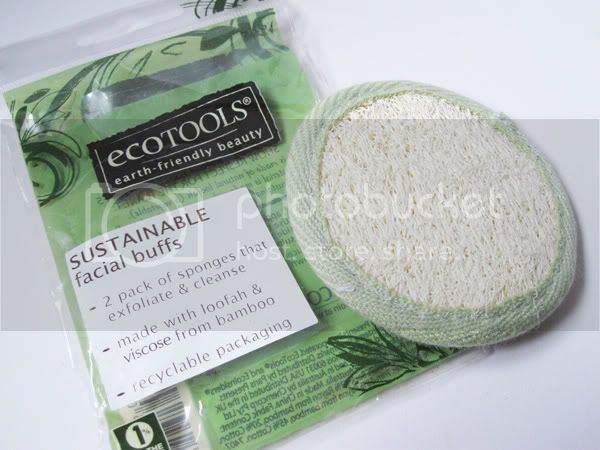 Have you tried / do you want to try anything from Ecotools? Ive always wondered about using eco tools and these photographs make them look lovely to use. Great review, i'll be getting a few of these to add to my collection! I was just looking at these yesterday! I am desperate for some new brushes and these sound so amazing. I love that they are so eco-friendly! I can see why this is one of your favorite gifts from Christmas. They look very nice. I bought these for my daughter, they are soooo soft! I have had the same brush set for about 8 yeas now and they are as good as new (from Shu Uemura). So it is definitely worth investing in something good! Lucky you here for this wonderful present!